Joomla! 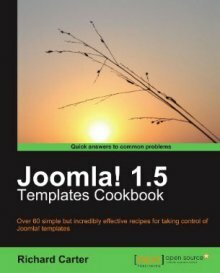 1.5 Templates Cookbook is my third book, which focuses on, surprisingly, customising templates for the Joomla! content management system. Chapter 7: Social Media and Joomla! Take a look at Packt’s website for more details on the Joomla! 1.5 Templates Cookbook; the book was released July 2010. The author of Joomla! 1.5 Templates Cookbook is Richard Carter, Creative Director at Peacock Carter Ltd.